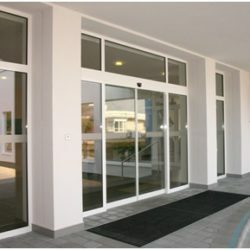 Systematic solution for fixed glazing, solid panels, glass display windows, glass walls for automatic doors, and many others. Profiles without an interrupted thermal bridge can be used for interior installations, whilst profiles with an interrupted thermal bridge for external installations. ALUPROF glazed aluminium walls are designed for the construction of lightweight cladding for buildings, which gives them a prestigious appearance. They are the perfect tool for shaping contemporary architecture. ALUPROF aluminium windows and doors are designed to fulfil their purpose for many years. In addition to quality and robust profiles, they are equipped with designer fittings (Dr. Hahn, Roto, Siegenia, and Geze) so as to ensure continued seamless operation and performance. Our product range includes both standard types of opening technology (openable, tilting, sliding, fold-and-slide PSK) and the currently widely used lift-and-slide MB 77HS system. In addition, we have a broad spectrum of finishes and colours to choose from. Your windows or doors can be in a one-colour / two-colour design in RAL colours, NCS colours, woodgrains, rough texture, etc. Our company also focuses on the manufacture and installation of aluminium-framed glass walls, windows, doors, and facades. In this area we closely cooperate with Aluprof as our supplier of profiles. Aluprof is one of the Europe’s leading distributors of aluminium systems for the construction industry. 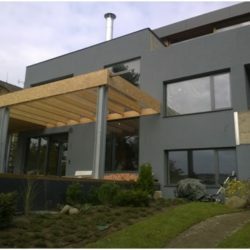 STARTUJEME WEBY Chcete taky web?